Most of the U.S. will experience thunderstorms from time to time, but the state with the highest occurrence of storms might be surprising. The 2012 Farmer’s Almanac included eight cities in Florida in their list of the top 10 most thunderstorm-prone cities in the U.S. Why did Florida dominate the list? It is the perfect region for thunderstorms, because its warm and humid conditions are highly favorable for storm development. 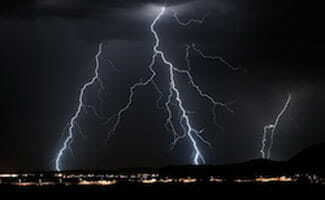 A thunderstorm is also known as an electrical storm, lightning storm or thundershower. It is characterized by the presence of lightning and thunder, and it is usually accompanied by strong winds, heavy rain and occasionally, snow, sleet or hail. They may occur as single storms, in a cluster, or in lines. Most thunderstorms produce heavy rain for a brief period, anywhere from 30 minutes to an hour. However, the most severe damage occurs when a single storm affects one location for an extended period of time. Downburst winds, large hailstones and flash flooding commonly cause the damage resulting from a thunderstorm. All thunderstorms can be dangerous and it is important to have a plan in place for thunderstorm safety. Flash flooding is responsible for more fatalities than any other thunderstorm hazard, and it is the leading cause of weather-related deaths in the U.S. Dry thunderstorms do not produce rain that reaches the ground, but the lightning can still reach the ground and can start wildfires. Read the tips below on how to prepare for and stay safe during a thunderstorm. Visit our Disaster Preparedness Plan page to learn more about Hurricane Safety, Tornado Safety, Fire Safety Tips and developing an Emergency Evacuation Plan. Also consider preparing a 72-hour kit to add an additional layer of safety for you and your family.